New England's history is ripe with unusual events. And while I am tempted to explore the possibility that ancient Irish, Scandinavian or Portuguese sailors were the first Westerners to arrive on New England's shores, as some fringe scholars suggest, this post will instead focus on events that undoubtedly did happen. The authenticity of these happenings, however, do not detract from their bizarreness. If you've ever walked along Commercial Street in Boston on a hot, summer's day and encountered a faint, sweet-smelling aroma, you may have caught a whiff of New England's unusual past. On January 15, 1919, a 58-foot high, 90-foot wide, cast-iron molasses tank exploded in Boston's North End, sending 2.3 million gallons of sticky, viscous molasses rushing outward. The resulting molasses waves garnered heights of between 8 and 15 feet and moved at speeds of 35 mph. With a force of 2 tons per square foot, the great molasses flood made short work of buildings, trains and trucks; burying some and hurling others into the melee. At the end of the day, 21 Bostonians were dead and 150 others were injured. To add intrigue to irregularity, there is not a 100-percent consensus as to why the Boston molasses disaster occurred. Possibilities include inadequate tank design/construction as well as unanticipated fermentation or sudden temperature increases within the tank. I'm fairly certain that this is the only recorded case of a molasses flood wreaking havoc on a city, but let me know if you have heard otherwise. Many of you likely learned about the Salem witch trials in school and are familiar with the historical episode's overarching bizarreness. Essentially, if you were living in 17th-century Salem, MA and a bunch of creepy little girls -- such as Ann Putnam, Mercy Lewis, and Abigail Williams -- decided they didn't like you, they accused you of witchcraft and you went to jail. Then you'd either rot in jail or stand trial, be found guilty and get carted off to Gallows Hill for a good ole' hanging. Yeah. I know. Pretty weird stuff. But it gets weirder. Of the 20 witches that the Salem court sentenced to death, one witch -- or more correctly, wizard, as that is what the people of Salem called male witches -- was never found guilty. Giles Corey, an 80 year-old farmer whose third-wife Martha was in jail awaiting trial for witchcraft, was accused of witchcraft himself after speaking out in his wife's defense. 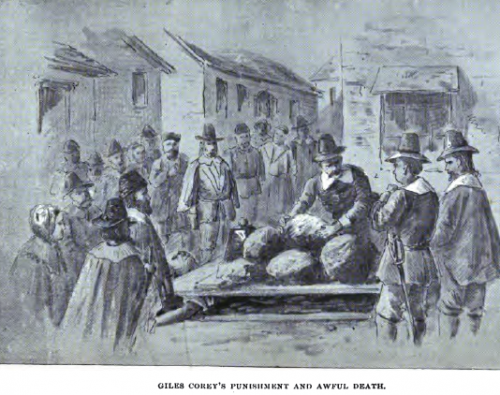 In a strategic move, Giles Corey refused to stand trial, which made it more likely that his sons would be able to inherit his property (as guilty witches automatically forfeited their estates). Unfortunately, the corporal punishment for refusing to stand trial in those days was worse than the punishment for being found guilty. Giles didn't get a relatively quick hanging death; instead, the people of Salem put a wooden board on top of his body and loaded the board with stones until the life was crushed out of him. This is the only documented case of death-by-crushing, also known as pressing or peine forte et dure, to have occurred in North America. The British invented the excruciating execution style in the 14th century and officially banned it in 1772. In my hometown of Woburn, MA, local farmer Samuel Thompson was plowing his 87 acres when the darkness set in. Samuel chronicled the event, noting that "such a Darkness was never known (I believe) by the oldest person living. People that were out could not see anything but gross darkness, could not find the way even unto their neighbors where they were acquainted, horses could not see to travail." The darkness lasted for approximately 15 hours, dissipating during the afternoon on May 20th. As the clouds parted, confused roosters crowed to welcome the return of the sun. Today, we know the cause of the Dark Day, but for over two centuries the origins of the event remained shrouded in mystery (pun intended). The phenomenon's culprit? Canada. In May of 1780, a massive forest fire in southern Ontario sent columns of dense smoke into the upper atmosphere. On the 19th, air currents carried those smoke columns over New England. So there you are, sitting anxiously at your computer, staring into the abyss of its illuminated screen while trying to convince your brain that it's time to write. For whatever reason, your trusty brain is on strike. All fours lobes of its cerebral cortex (frontal, temporal, occipital and parietal), its cerebellum, its stem and yes even its limbic system have unionized and decided that today, at this very moment, you shall not be doing any writing. Writer's block can affect all kinds of writers, including novelists, screenwriters, playwrights and poets as well as technical writers, copywriters, journalists and bloggers. As a content writer, I've had my battles with writer's block and have occasionally turned to online resources for help. The majority of these resources recommend psychological solutions: brainstorm your ideas, organize your thoughts, swap out your negative thoughts with positive ones. For me, however, writer's block will typically set in after completing these mental remedies. I'll have a fully-researched, organized page; my fingers will be lined up on the keys ready to strike; my mind in a state of complete positivity. And then, nothing. When the only thing left for a writer to do is write, but the writer can't write, what does a writer do? Your brain is hardwired to your body. In addition to coming in contact with other neurons, the neurons in your brain come in contact with skeletal muscles at a structure known as the neuromuscular junction. As a result, activating your muscles, such as through some simple stretching exercises, will activate brain receptors and help improve the connections between brain synapses. Purdue University's Online Writing Lab (OWL) recommends tensing and releasing different muscle groups in the body for between 5 and 10 seconds at a time, starting with your feet. While stretching is a physical writer's block remedy that you can complete at your desk, going out for a walk will provide your brain with a bigger boost. Walking increases breathing and heart rate, which forces more energy-enhancing, oxygenated blood up to those thirsty brain cells. In addition, walking can help you pump-up your brain muscles, or more accurately, encourage "cerebral blood vessels to grow," as The Franklin Institute notes. So the next time your brain is idling in front of a blank page, try putting your body into gear and go for a walk around the block. Our early human ancestors were rovers, who spent their days scouring the Earth for sustenance. They did not sit at that same desk everyday, looking at that same ugly desk lamp and that same pointless container full of ballpoint pens that no longer write. Instead, early homo sapiens were encountering new views and vistas all the time, with their brains constantly reacting to the colors and details of their surroundings. Today, roving for writer's block can be as simple as transporting yourself and your laptop to a park bench or even to a different corner of the office/room. The point is to stimulate your brain with new surroundings when you feel writer's block setting in. If you are like me, you can't start your day without a cup of hot, black coffee. And you usually can't continue your day without at least one or two cups more. When writing, I find there is a "caffeine balance" you can achieve, wherein you are alert and attentive, but not jittery or fidgety. Achieving this balance, however, will typically require drinking less coffee as opposed to drinking more (which makes this tip/trick more of an inaction than an action). According to Neel's Corner, too much coffee consumption causes you to feel stressed and can potentially increase your blood pressure, putting you at risk for heart disease. Boston has served as the setting or central theme for several great songs, like Dirty Water by The Standells and Rock & Roll Band by Boston. This post is only highlighting Boston songs that have Celtic roots or "vibes." I found it difficult to rank them numerically, so instead I categorized them by lyrical content and style. Let me know if there are any other great Celtic songs about Boston out there. "I was born and raised in Boston, a place you all know well"
"Now you citizens of Boston, don't you think it's a scandal?" While some might call Charlie on the M.T.A., or simply M.T.A, a bluegrass, folk or Americana song, I've always thought of it as a classic Celtic voyaging tune, in the vein of The Irish Rover. The melody of M.T.A. comes from the 1865 Henry Clay Work song, The Ship That Never Returned, but Jacqueline Steiner and Bess Lomax Hawes reworked the lyrics in 1949, transforming the song into a campaign-booster for the mayoral candidate Walter O'Brien. M.T.A. follows the exploits of Charlie, who is unable to pay an exit fare on a Massachusetts [Bay] Transit Authority subway car and -- as a result -- must "ride forever 'neath the streets of Boston." The Kingston Trio, originally from the San Francisco Bay Area, made the song famous with their 1959 recording. "There's a girl in Massachusetts, south of Boston town"
Boston Rose was written by Liam Reilly, an Irish singer/songwriter and one of the founding members of the Celtic band Bagatelle, which formed in Co. Louth in 1978. The song is a lament of the "girl in Massachusetts", who is originally from Ireland -- like the narrator -- but "had to fly across the ocean wide." The Wolfe Tones recorded the most popular version of the song in 1989. However, I couldn't bring myself to embed their music video due to its extreme creepiness. If you're up for a laugh, check out The Wolfe Tones Boston Rose music video on YouTube. "Shipping out to Boston / To find my wooden leg"
I decided to show my Celtic/folk band -- Devaney's Goat -- playing this one at the Irish Embassy Pub on St. Patrick's Day 2010 in Montreal (I'm the one howling the lyrics into the mic, in case you were wondering). I think the clip, which also includes our take on Drunken Sailor, helps exemplify why I'm Shipping Up To Boston is such a romp: a romp being defined as "a spell of rough, energetic play." Legendary American folk singer/songwriter Woody Guthrie penned the lyrics, but it was the Dropkick Murphys, as you may already know, who put those lyrics to music and made a hit. "People say that Boston is just one big Irish town"
A native of Co. Galway, musician Don Stiffe spent the 1990s in Boston and didn't necessarily enjoy himself. He writes, "Well it wasn’t like the Lisheen or the pubs up in Clonbur / But the people here in Boston like to make you feel as if it were." Despite commending Bostonians for their hospitality, the bottom-line is that Don wants to get the hell out of Beantown and go back to Ireland: "Each mornin’ when I wake up and I start a brand new day / I look forward to going back to Galway." Regardless of its take on the city, the song has vibrant instrumentation and a great traditional Celtic feel. "I have a wife in Boston by the sea"
Several Celtic songs mention Boston in a verse or chorus without elaborating much further or using the city as a central theme. Examples include Boys Of The County Cork (traditional), When The Boys Come Rolling Home (by Tommy Sands), Inter Milan (by Mick Chinford), Body Of An American (by Shane MacGowan), You're Not Irish (by Robbie O'Connell), No Time For Love (by Christy Moore), St. Patrick's Day (by Derek Warfield, founding member of The Wolfe Tones) and The Flight Of The Earls (by Liam Reilly). My favorite name-drop, in quotes above, comes from the traditional Celtic song The Mermaid. Also known as The Wrecked Ship and Waves On The Sea, The Mermaid dates back to at least the mid-18th century. What do you think of when you read the word bard? A stage actor? A poet? Shakespeare? Most dictionaries define a bard as a Celtic composer and reciter of poetry, specifically one who commemorates the deeds of heroes or patrons. In 16th-century Scotland, people used the word -- which has its linguistic roots in Gaelic -- as a derogatory term for roving musicians. Fortunately, Scottish author Sir Walter Scott helped rescue the word from this negative connotation. Check out his poem The Dying Bard...it's really not as depressing as it sounds. "And where is the bard shall give heroes their fame?" Today, I like to think of a bard as any person who creates art, specifically art that commemorates culture, history or a particular experience. This definition allows for a higher level of inclusiveness, as anyone -- even you -- can be a modern-day bard. Come up with a new riff on your guitar; write a poem, story or joke; make a sketch or a painting; cook a new, unusual meal. Bardic creativity shouldn't be limited to producing verse about employers and warriors. The point is to be putting something out there, actively participating and contributing to culture; not sitting back, listening and observing culture. You should be baking the cake; not just watching Buddy the Cake Boss baking cakes on TV. If you're a painter that loves Da Vinci's style, you can use some of his techniques to enhance your own unique creations. But if you produce a painting of a woman that is identical to Da Vinci's Mona Lisa -- sure, that's pretty amazing -- but you haven't created creatively: you've regurgitated an existing creation. To be a modern-day bard, you need to add something new to the world's cultural archive, even if that something new commemorates something old. Expand your bardic horizons by pursuing different modes and styles of creation. If you are an accomplished haiku poet, try writing a silly limerick (hint: use a Massachusetts place-name as a starting point). If you always cook family-style Italian meals or Irish stews, explore a cuisine that is more foreign to you, like Thai or Indian. If you are an accomplished painter, try experimenting with charcoal drawings, or better still, go outside the realm of fine arts and learn a musical instrument -- or several. Few people are able to support themselves financially as professional bards. For the rest of us, bardic activities should be supplemental, recreational activities, which we can pursue on the weekends or during our lunch breaks. Unfortunately, some people abandon potentially helpful academic and business opportunities in the pursuit of idealized bardic lifestyles, only to end up broke. I like to think of the traditional Celtic song, The Wild Rover, as a story about a bard who had a poor business-sense. At the end of the story, the protagonist has wasted all of his money on alcohol and must beg his parents to let him move back in with them. What a bummer. And I'll ask them to pardon their prodigal son." If you don't feel comfortable putting your original songs up on MySpace or putting your original artwork up on Flickr, don't. The notion of keeping your bardic creations private is especially relevant for people whose creations are perhaps a bit risqué or otherwise at-odds with a particular corporate culture or business community. Instead, share your creations with family members or a few close friends. While this limited sharing will not allow for a global cultural impact, it can still effect your familial and private cultural circles. In addition, the act of creating creatively in itself will be beneficial, as it gives your right brain -- the creative, imaginative brain -- a workout. During one of these bardic, right-brain workouts, you may even find yourself thinking up a new, brilliant business strategy or marketing idea.